Petitions have been filed in the U.S. Court of Appeals for the 9th circuit, requesting a rehearing en banc with regard to a recent ruling that determined that California's low carbon fuel standard program does not violate interstate commerce laws. Butanol has a new ASTM International standard, intended for blends with gasoline at 1 to 12.5 percent volumes to be used as an automotive spark-ignition engine fuel. The new specification, ASTM D7862, covers three butanol isomers. Butamax Advanced Biofuels LLC, a biobutanol technology company, and Highwater Ethanol LLC, a producer of first-generation ethanol, have begun to retrofit Highwater's ethanol plant in Lamberton, Minn., for the production of biobutanol. BlueFire Renewables Inc. has integrated a synergistic wood pellet production plant to its facility in Fulton, Miss. The reconfigured design will be a 9 million gallon per year ethanol plant integrated with a 400,000 ton per year wood pellet plant. Big River Resources LLC and Prairie Gold Inc. have signed agreements forming a joint venture to produce corn zein proteins. The new venture, Big River Prairie Gold LLC will construct and operate a zein production facility near Galva, Ill.
A second ethanol plant announced Oct. 1 it had agreed to purchase sugar through the Feedstock Flexibility Program for Bioenergy Producers. 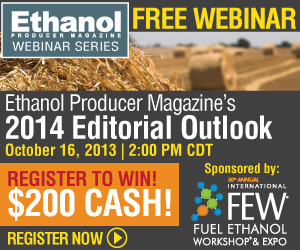 Pacific Ethanol Inc. joins Front Range Energy LLC in taking advantage of the program. Nebraska-based Laurel BioComposite LLC recently moved into a newly constructed manufacturing facility, a fact celebrated during a Sept. 25 open house and ribbon cutting ceremony. The company's first production line is now operational. The Canadian government will invest $734,500 in a cellulosic ethanol project under development by Vanerco, a joint venture of Enerkem and GreenField, through Sustainable Development Technology Canada's Next Gen Biofuels Fund. Edeniq Inc. announced it has received notice of allowance from the United States Patent and Trademark Office, protecting three targeted process applications. The new patent is entitled "Materials and Methods for Converting Biomass to Biofuel." Eco-Energy has announced additional growth to its global ethanol platform with the signing of a new multiyear marketing agreement with Heron Lake BioEnergy, located in Heron Lake, Minn. Eco-Energy now markets for 18 plants across North America. UNICA, the sugarcane association of Brazil, has revised its sugarcane forecast for the 2013-'14 season, reducing the crush estimate by 0.44 percent, from 589.6 million metric tons to 587 million metric tons. ECI has begun the registration process to offer E15 to 2001 and newer vehicles in the Cedar Falls/Waterloo area in Iowa. "After reviewing the economics, offering E15 to 2001 and newer vehicles just makes sense for us," said Terry Grant of ECI. University of California, Los Angeles chemical engineering researchers have created a new synthetic metabolic pathway for breaking down glucose that could lead to a 50 percent increase in the production of biofuels. Proterro Inc. recently announced it has met key new development milestones. "We scaled up our novel photobioreactor design and conducted independent functionality tests that confirmed the unit's robustness," said Proterro CEO Kef Kasdin. The U.S. Energy Information Administration has released new statistics as part of its Monthly Energy Review outlining ethanol production and consumption data through June, showing that consumption increased during the first half of the year. Research shows it's now possible to prevent stress corrosion cracking without resorting to completely removing oxygen from ethanol, which is expensive to do. Sacrificial metals or inhibitors, for example, can be used. The Iowa Renewable Fuels Association has released new testing data from vehicles driving in the real world that demonstrates Big Oil's earlier Coordinating Research Council testing on E15 has no real world implications. Lignol Energy Corp. has released its unaudited consolidated financial results for its first fiscal quarter of 2014, the three months ended July 31. The company reported an operating loss of $980,000, up slightly from the same quarter of last year. The Renewable Fuels Association and Growth Energy are disputing the results of a new poll released by the American Petroleum Institute, calling the data biased and deceptive. The poll was conducted by Harris Interactive. Brazil has made great strides in increasing its total energy production, particularly oil and ethanol. In a recent analysis, the U.S. Energy Information Administration noted that Brazil is the eighth largest energy consumer in the world.